The Pusher is a minor Marvel villain. He only appeared in a 1972/73 Astonishing Tales story arc. 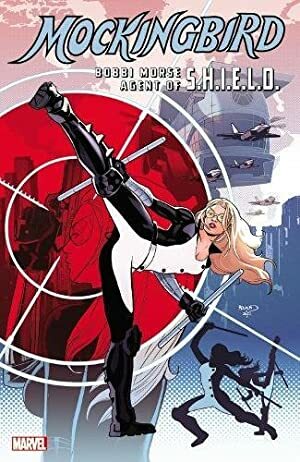 Unless you’re a Ka-Zar fan, he’s mostly notable for playing a tiny role in Bobbi Morse’s evolution into the Huntress, then Mockingbird. Group Affiliation: Works for Boss Morgan, and leads his own crew. Eyes: Blue, of course. Hair: Bald. The Pusher is a hardened criminal leader, specialised in narcotics distribution. He knows the New York City underworld well. He’s also in terrific shape, and an accomplished martial artist. A third-dan black belt in what I assume was a style of karate is mentioned. The Pusher can take out several ordinary street thugs within seconds. 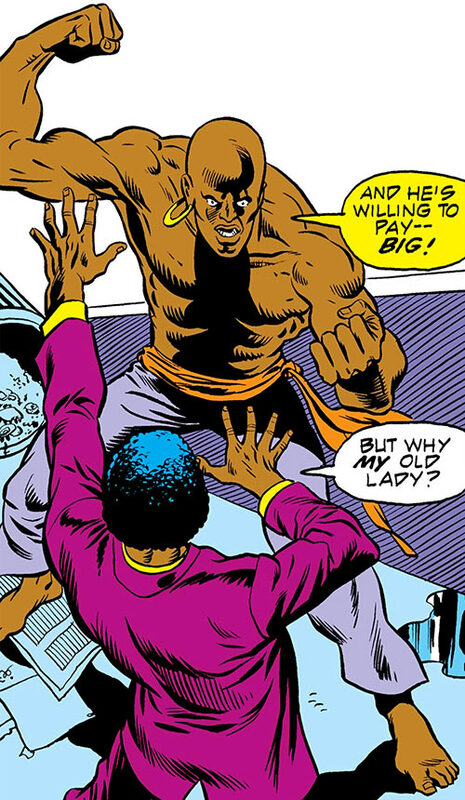 And of course — this is the 1970s — he can smash bricks with his bare hands. The Pusher was outmuscled and outfought by Ka-Zar – lord of the jungle ! But one should keep in mind that Ka-Zar is peak human. The Pusher thus ain’t no creampuff, and could take several punches from Ka-Zar. He likely performs as well as most martial art movies characters. 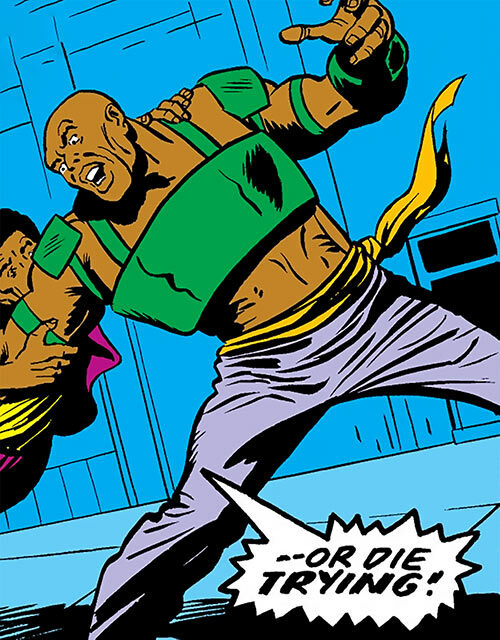 During his rematch with Ka-Zar, the Pusher wore a strength-amplifying harness. It seemed to bring him to peak human levels, making him a match for Ka-Zar in that respect. This may have been AIM equipment. Back in the early 1970s, the Pusher was a lieutenant of the main Harlem crimelord, “Boss” Morgan. He seemed in charge of expanding drugs pushing into new turf. The lieutenant was a fitness, martial arts and bodybuilding enthusiast. He insisted that his gang seriously work out and learn close combat techniques. In fact, his headquarters was a gym. His authoritarian insistence that his men exercise to exhaustion was another reason why he was nicknamed “the Pusher”. At the close of 1972, the Pusher’s men caught an independent drugs dealer on their turf. As they beat the freelancer up, they were dispersed by Ka-Zar — lord of the jungle ! — and his faithful Zabu. However, one of the thugs managed to run away. He then doubled back and knifed the freelancer dead. Not long after that, Pusher agents attempted to kidnap Dr. Wilma Calvin, the mentor of Dr. Bobbi Morse. AIM agent Gemini (Josh Link) was offering a vast sum for her, to get his hands on her Super-Soldier serum research. Ka-Zar stopped these too, then located the Pusher’s base. The brawl was so brutal that the shoddy building collapsed, separating the fighters. But they were both determined to meet anew. The Pusher took down an undercover narcotics NYPD officer. He also grew irate at one of his men, “Vinnie” — actually Percy Calvin, Dr. Calvin’s son. But Vinnie didn’t back down. Respecting his courage, the Pusher decided to let him live. Mr. Calvin would also be perfect to bait Ka-Zar. The trap worked. Wearing a strength-amplifying vest, the Pusher could hit Ka-Zar from behind while the Lord of the Savage Land was interrogating Vinnie. But before the Pusher could inject Ka-Zar into overdosing, Vinnie attempted to stop him. The powerful criminal had little trouble beating Mr. Calvin to a pulp. However, Vinnie’s courage allowed Ka-Zar to recover. The lord of the jungle — Ka-Zar ! — overpowered the Pusher. He left him alive for the NYPD to arrest, and rushed Vinnie to the hospital in time to save his life. The Pusher was glimpsed in jail, perplexed by hearing police officer Damien Link briefly speak with the same voice as the AIM agent who had hired him. 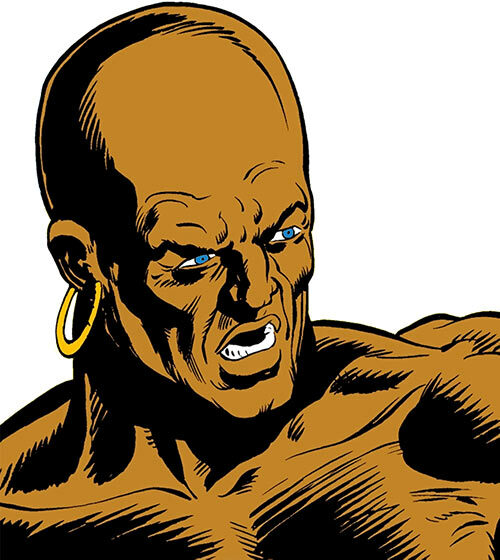 Bald, very muscular, tall, large golden hoop earrings. He has a vague Jamaican pirate look. The Pusher often goes bare-chested, only wearing gi trousers. The Pusher is all about strength and courage. He has a “king of the concrete jungle”, Darwinian outlook. He’s also a violent murderer with a big ego, ruling through force and fear. His threats and snarls are oddly articulate. Perhaps he read a lot of tough guys pulp adventure novels as a kid ? Maybe he’s a big fan of the Copperhead and/or the Shadow. After all, the Pusher does know about the evil that lurks in the heart of men. The Pusher respects courage. If somebody confronts him without fear, he’ll likely let them live. Once. He could have repeatedly clashed with Black Canary and Speedy (Roy Harper) during unchronicled 1970s team-ups of theirs. Area Knowledge (New York City), Familiarity (New York City mobs, New York City narcotics trade, Martial arts lore). Street (Low), Underworld (Low), Boss Morgan (Low). STRENGTH AMPLIFIER [BODY 03, Enhance (STR): 01 (cap is 05), R#03]. This was only used once. Source of Character: Astonishing Tales Vol. 1 #15-17. Writeup completed on the 24th of July, 2018.